As a Willowman regular, I was particularly looking forward to this year’s festival; it has always been a firm favourite of mine not only due its location (being a short 40 minute drive from home) but it is what I consider to be the perfect size (not too big!) and always offers a fantastically diverse line up. Arriving separately from the rest of my camping party on the Friday, I was speedily ushered through the ticket office and clearly signposted to the dedicated car parking by the friendly and helpful ticket staff. After swiftly directing me to my parking space, one lovely steward chap advised me that it was “compulsory to have a great time”. No problems for me there! The usual ‘car to tent trek’ was made far easier by another lovely gent on a tricycle contraption, who loaded up all my camping gear and peddled it up to the camping area then helpfully unloaded it again, a service offered for a small £5 donation. With the obligatory couple of cases of cans to carry on top of your tent, rucksack etc. I think it was an absolute bargain! 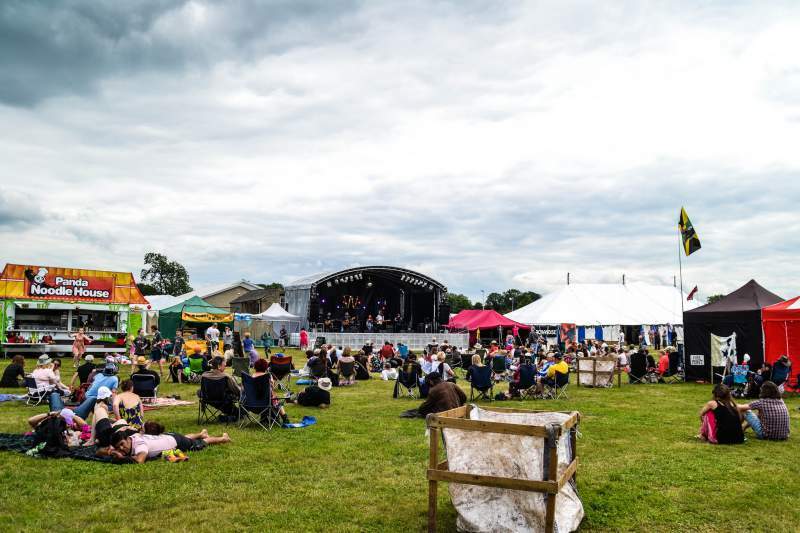 Heading straight over to sample the acoustic offerings, I was eager to see how it had morphed into a full stage, after seeing the first independently promoted acoustic sets offered at the festival from 2012 within the Creative Intentions Café. The covered Acoustic Stage, still located right next to and hosted by the café, did not disappoint with a delightful eclectic mixture on show, from country-folk delivered by Parson’s Lot, a colourful set from Pocket Full of Nowt and an interesting Laura Kelly, who used a loop pedal and eerily shifted created a male voice to introduce her (somewhat scary) alter-ego ‘Trevor.’ A highlight from the open mic session on the Acoustic Stage was a beautiful soul called Helen, who told us this was her first performance in 15 years and proceeded to deliver us into a wonderful folky, uplifting place. Let’s hope she doesn’t wait another 15 years to perform again; talent like that should be heard! Lounging on the scattered floor cushions in the fabulously chilled-out Creative Intentions Café, reminiscent of an Arabian style Bedouin tent complete with twinkly lights, rich colours and bongs (though of course with nothing illegal in them), and a dressing up box for the little ones, I sipped the most welcoming brandy hot chocolate. I wished I had more time to waste in this lovely place full of wonderful people and vibes. Time to move on for more musical delights. Onwards to the Wibbly Wobbly Stage to see The White Negroes wowing the crowds with their rousing set full of favourites, which had everyone jumping along with the beat. Ending their set with a surprisingly emotional rendition of Candi Staton’s You Got The Love, dedicated by their lead singer to “remembering absent friends”, was more than some folk could take with at least one audience member in tears. Feedback heard afterwards proves that even after 25 years this Hartlepool band are still converting new fans. Over on the Main Stage, Echo and the Bunnymen totally nailed it with what has got to be one of their best performances. Everything you would expect was up there, including Read it in Books, The Killing Moon, Bring on the Dancing Horses, and All My Colours, alll with perfect sound and atmospheric lighting. A sublime set ended with Ocean Rain, the title track from their seminal 1984 classic album, and the perfect end to an amazing day. What started out as an overcast Saturday did nothing to deter festival-goers from enjoying themselves driving around in a random dodgem car and sampling the many craft and jewellery stalls, henna painting, vintage clothes shops and array of culinary delights on offer (all very reasonably priced too). A food highlight for me had to be from The Fish Finger Butty stand, served up with the most delicious homemade tartare sauce and a friendly chat. But back to the music…second up on the Main Stage, Willowman festival organiser Steve Williams and the Blues Deluxe delivered a particularly tight and dynamic performance, melding R&B with flavours of jazz and soul, which set the standard for the rest of the day’s acts to follow. South Tyneside’s Bessie and the Zinc Buckets returned to the festival following last year’s triumphant set on the Wibbly Wobbly Stage. Their manic blend of rockabilly and classic rock covers drew a rapturous crowd to their feet and the reclusive sun from behind the cloud. Highlights included an inspired Jonny Cash style take of Pinball Wizard and they nailed the harmonies on The Carpenters’ Yesterday Once More. Headlining Saturday night on the Wibbly Wobbly Stage, The Toasters raised the roof with their 2-Tone driven ska set. Drawing from their very impressive back catalogue, the infectious tunes had the whole tent dancing and clamouring for more long after NYC’s finest had left the stage. The evening culminated on the Main Stage where headliners Peter Hook & The Light treated us to classic Joy Division and New Order, in what was Peter’s son Jack’s last gig with the band for the summer (he’s off to play bass on the Smashing Pumpkins’ tour). The band delivered an impeccable set with legendary stage presence, involving the crowd and giving us what we wanted including Transmission, Age of Consent, True Faith and the superb Love Will Tear Us Apart. Coming around all too soon, Sunday dawned with more cloud and rain but no one was letting the great British weather spoil one minute of the festival. Looking dapper in suits, bow ties and the odd Stetson cowboy hat, Big Red & The Grinners entertained a busy and enthusiastic crowd with their rousing blend of bluegrass on the Wibbly Wobbly Stage. With some lively double bass solos and a few shouts of “can I get a big yeehaa!” I believed I was at a big barn dance. Over on the Main Stage, Hazel O’Connor was vocally powerful and on form opening with I Call Out Your Name, and flawless harmonies on If Only. The old favourite Will You got the crowd singing and the sax solo was mesmerising. The trio of keyboard, vocals and saxophone without a gutsier backline did not quite work for me personally on a Main Stage though. I felt some of the soul was lost and would have liked to have heard this setup in a more intimate, enclosed staging. However, Hazel’s performance itself was faultless. Last on and closing the festival this year on the Wibbly Wobbly Stage was Nottinghamshire’s Ferocious Dog with their fantastic mix of high energy folk, ska and punk, often straying into dub reggae. Playing what appeared to be firm favourites with many of the crowd, including Gallows Justice and Freeborn John, the band also included current single Ruby Bridges. I for one will be looking out for their new album which they are self-releasing in the next couple of weeks. A great ending to what is still firmly my favourite festival.